Hello everyone! How was your Tuesday? Mine was alright – the work part was meh, but the hockey part was, obviously, awesome 😉 And since hockey started right at 5 pm this evening, I figured I would just combine lunch & dinner into one mega post. So, let’s take a look at lunch, shall we? 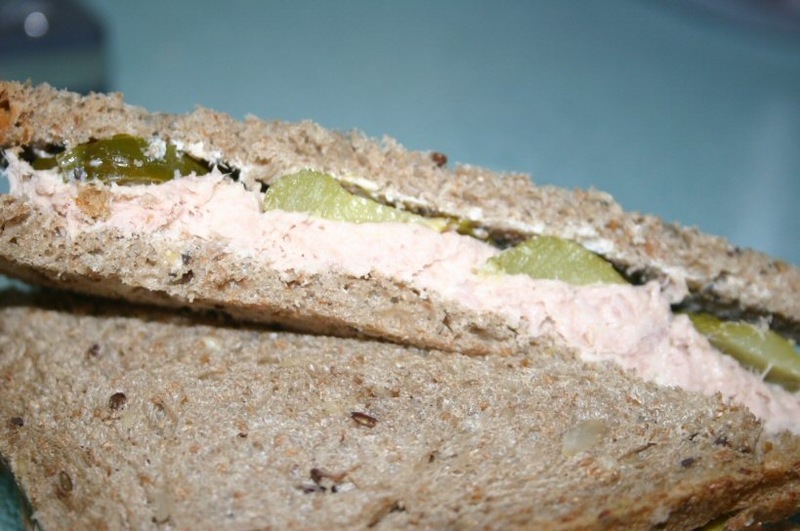 It all started with a tuna sandwich – tuna mixed with low-fat mayo, spread on some Irene’s Bakery Multigrain Bread with some dill pickles. 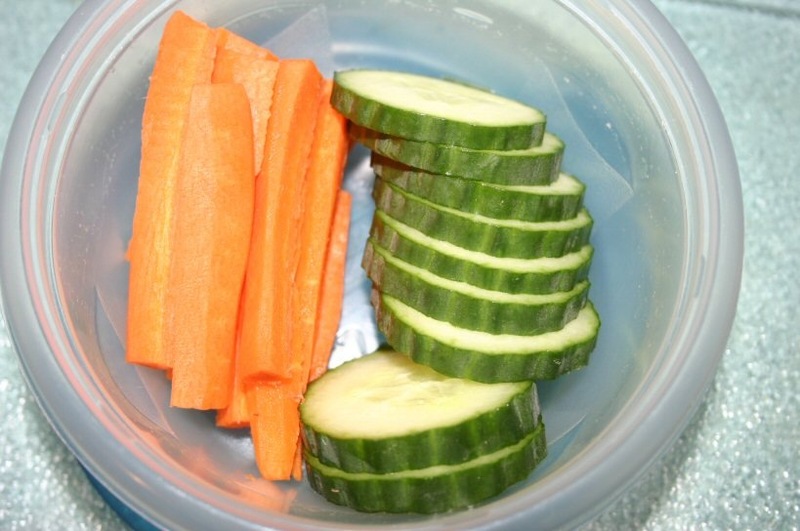 The standard side veggies – carrot & cucumber. My true raw veggie loves. 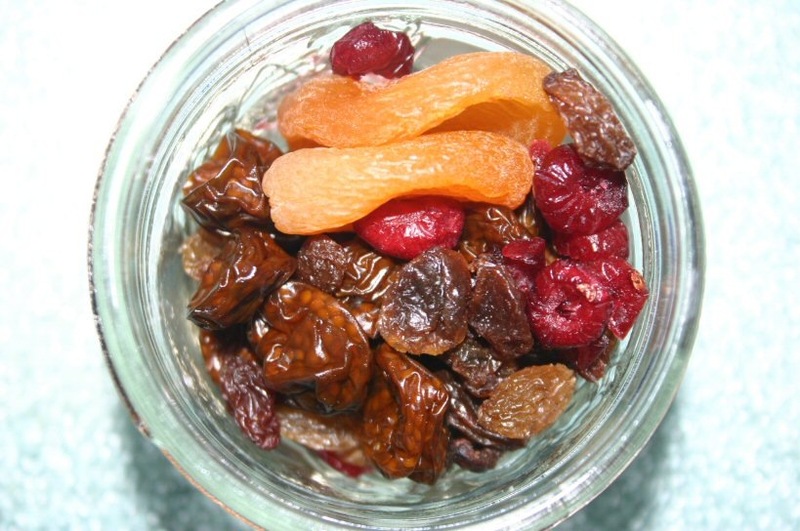 I reprised the dried fruit medley from last night – craisins, raisins, golden berries – with a couple of dried apricots along for the ride. Nuts! 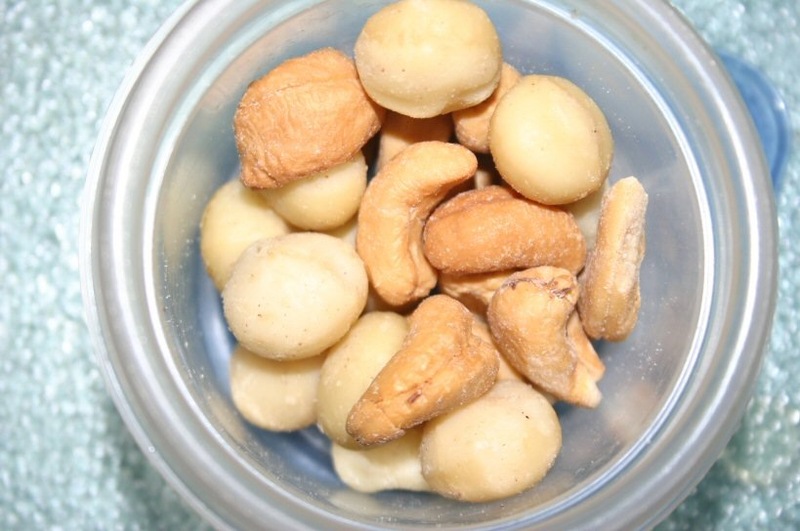 Cashews & macadamia nuts. And a little edamummus to go with them there veggies. 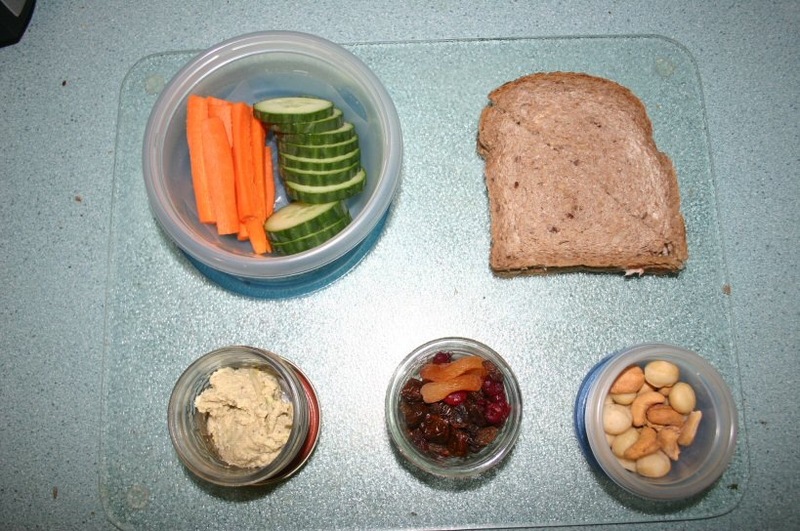 The dried fruit & nuts made great snack options today. I had a meeting mid morning where there were some lovely muffins from Market On Yates. My favourite – the lemon cranberry poppy seed – was there, but I knew I really didn’t need to eat one of them. Not to mention, I wanted to avoid setting off my stomach (which, went much better today than yesterday, in case you were wondering). I find it funny how people are taken aback when you choose not to have something like the provided muffins at a meeting. It’s like, what do you mean you don’t want this muffin I brought just for you? Meh, oh well, it’s not like they went to waste – put any meeting leftovers in the kitchen, and the vultures my coworkers eat them up ASAP! I had taken out a turkey breast from the freezer last night to thaw in the fridge, and wasn’t sure what I was going to make with it. My mind kept thinking, I need to make good hockey watchin’ food. Chicken fingers came to mind…well, no, turkey fingers I guess! But I had no bread crumbs. My coworker suggested panko. Bingo! I cut the turkey into fingers, then dredged it in some seasoned flour (salt, pepper, onion powder, parsley), then a mixture of milk & dijon mustard, then into the panko. I baked them up, and dinner was born. Since I was firing up the oven, I figured roasting some veggies was a good idea. 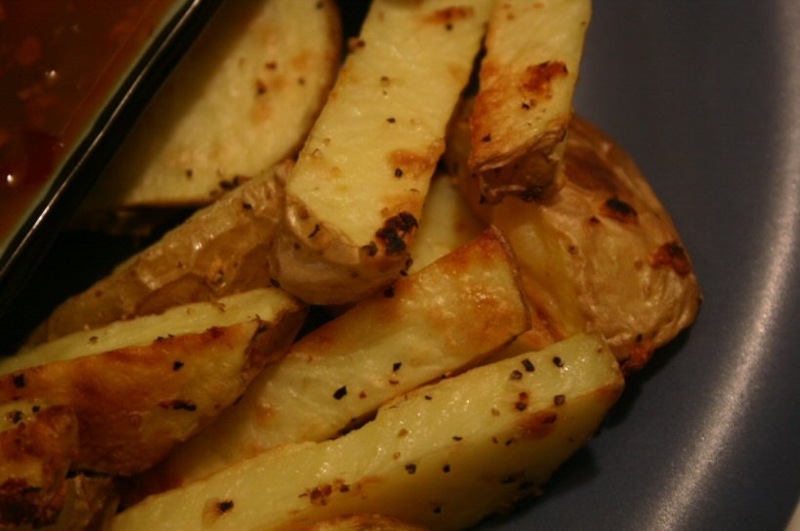 I made the tiniest Yukon gold fries (the potato was small). And I had about 2/3 of a head of cauliflower, so I threw that in as well. I topped half of it with some cheddar cheese (mmm, cheese), and served the whole lot with sweet chili sauce & sour cream for dipping to my heart’s desire. Dinner was a bit on the monochromatic side, but it was all sorts of good. How much do I love those panko bread crumbs? I’ve had them at restaurants before, but I’ve never used them myself. They make for some mighty fine breading. As for the hockey game – we won! Woot! Good thing, because I fear if we had lost this game, we wouldn’t fair well in this playoff series. But now we can win the next two, and I’ll be able to watch that second game at my parents’ place on the big screen in HD. Yeah baby! Did I mention my stomach was doing better? 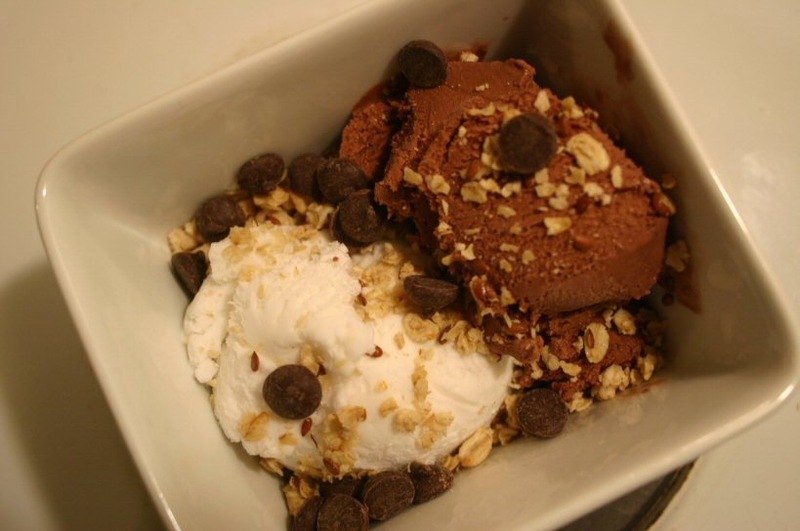 It was even in the mood for a little ice cream – So Delicious Coconut & Chocolate Coconut Milk Ice Creams, a few chocolate chips, and some Nature’s Path Vanilla Almond Granola for crunchy fun. 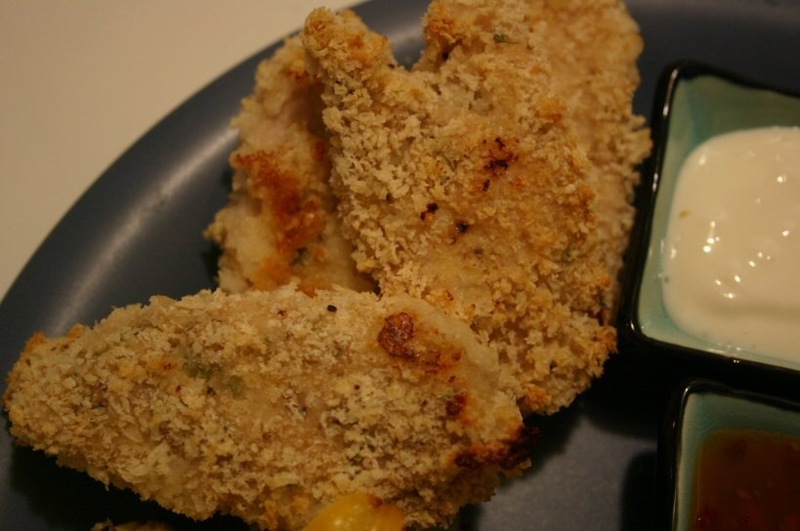 oh i love panko, what a creative way to use it! thanks for the idea. the whole dinner looked super good. and can i just say i am totally with you with the not eating refreshments at work thing? my bosses are RELENTLESS.. if someone brings in donuts or muffins they think it is humorous to come eat them in front of me and set them all over my desk, it does not waver my self control but it is super annoying. haha sorry just had to vent my agreement! Grrrreat meal!!! I’ve got some panko in the pantry that I haven’t used yet. I should pull it out! If I’m in a work meeting with treats that I don’t want, I’ll take something that I know one of my family members will eat and bring it home to them. This avoids the snide “you are SO healthy” remarks that usually accompany a no thanks! That is perfect hockey watching food! I`ve never tried panko before! 1. Glad your stomach was better!! 4. 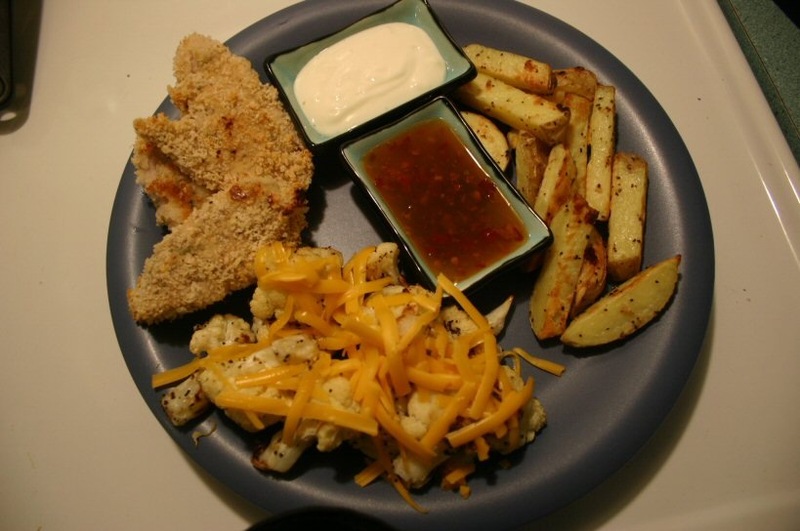 Cauli and cheddar – yum! Just curious how you do your taters on the oven. Mine NEVER turn out looking that beautiful.. I must be doing something not-so-right.